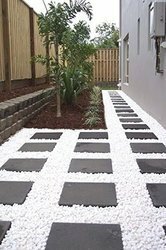 Our range of products include walk path garden pebbles stone, garden pebbles stone, pathway garden pebbles stone and white garden pebbles stone. Aqua Minerals supply Walk Path Garden Pebbles Stone use as walkway, pathway, stepping stone etc. We supply flat polished and unpolished pebbles also. We provide different variety and size of pebbles as per client’s requirement. We are among the celebrated names in the industry, engaged in offering Garden Pebbles Stone for our customers. The offered stones are made available in several sizes and shapes for the convenience of the customers. These pebbles are rendered a fine surface finish for enhancing their appearance. We offer natural Pathway Garden Pebbles Stone with different size and color. Our product is used extensively in decorating the fountains, plants background, and pathways in the garden. Being used at a large scale these pebble stones are the best choice for various interior-designing purposes. 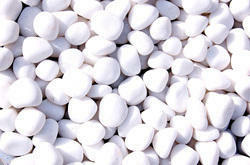 We are offering White Garden Pebbles Stone to our client. The smooth touch of our polished decorative stones for garden will WOW anyone in search of the perfect garden rocks or garden pebbles.